El regreso. (5 min sample) from Mariangela Lopez on Vimeo. El Regreso (the return) is the going back to the self, a reflection, a necessity. 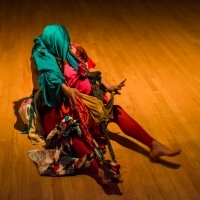 After working and investigating the individual journey within a large community of performers for so many years, Mariangela López is going back to her own body as an attempt to understand her own ideas from her own physicality and inner world. She is using the power of the group as a catalytic energy that will guide her through this voyage. In this process she is transposing the relationship of the group and herself; how can they be present in the solo performer? How can she become a vehicle and a mirror of their own dreams and ultimately find the ritual that allows total exposure to achieve body/mind emancipation? In El Regreso, Mariangela searches for a way to move by the absolute desire to fulfill her instinctive connections to the imagery that is created in the moment and that belongs to all of us. She continues her obsession about challenging the boundaries between presenting as suggesting and the reciprocal process of seduction between the self and the surrounding. El regreso was made possible thanks to an Artistic Residency at BAX. BAX/Brooklyn Arts Exchange Artist in Residence Program is supported by The National Endowment for the Arts (NEA), The New York State Council on the Arts, the NYC Department of Cultural Affairs, The New York Community Trust, Mertz Gilmore Foundation, and The Andrew W. Mellon Foundation.